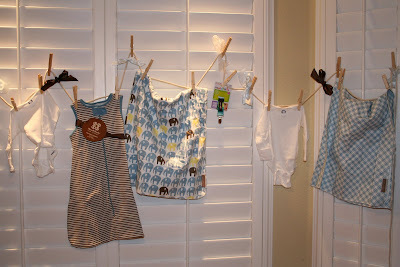 April Kennedy...My Life + My Style: BABY CLOTHES LINE. I'm going to a baby shower this weekend and this is her gift. Don't worry....she doesn't read my blog [at least I don't think she does]. 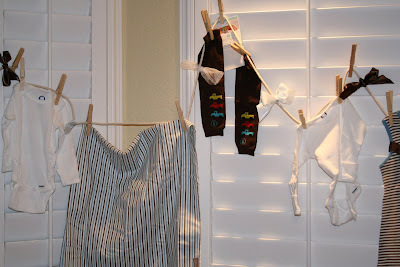 I love putting together these baby clothes line gifts. 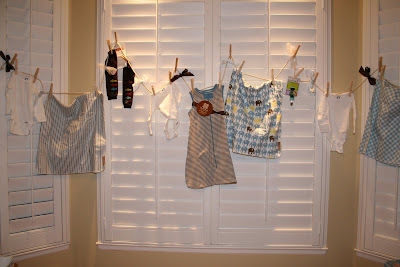 After hanging all the clothes with clothes pins on the rope, I layer the clothes line in a large gift bag and then the mommy-to-be starts pulling out one end of the clothes line, passing it around the room as she continues to pull. It is always a fun gift to open and it really isn't as expensive as it looks. A 3 pack of onesies, a 3 pack of receiving blankets, a little sleeping sack, a pair of baby legs and a little accessory. [I chose a pacifier strap that coordinated with the colors I chose.] Here a few close-up pics. Ok, I think you are officially the most creative person I know!! What a great idea! I just blogstalked you and now I am off to bed! Night! Remember everyone ~ she's my daughter - shares my DNA - my sassy gene pool. OK...I can't take all the credit. I did see it as a decoration idea in a Baby Shower book by two girls that used to work for Martha Stewart [hanging three onesies from a clothes line]. Then I saw another friend do it at a baby shower and I took off with it! Everyone has their own style though. Mine definitely have to have a color scheme with matching bows and all! What a fun idea! I will be using this at the next baby shower I get to go to. What kind of "line" did you use? Rope? I love it. I checked out the birdies today and thought they were too precious. I can't wait to actually be able to decorate a room for Audrey. What a fun friend you are too. I'm jealous. You're totally invited to my next baby shower...LOL I probably won't have one, but thanks for the idea anyways.... have a great weekend. That is so cute!! I have seen that before, but not as a gift! Another A+ from 4 Kennedy's! Have a fabulous weekend and a fun time at the shower!! I love Target Dwell too. So chic. You are very talented.!! I really like the idea of baby shower. very clever idea. love it!